Packer running back Jim Taylor battles Giants defense in the 1962 NFL championship game. The last time the NFL championship game was played in New York, more than 51 years ago, President John F. Kennedy was in office, the epic film Lawrence of Arabia had just premiered in London, and the Beatles had yet to set foot on American soil. 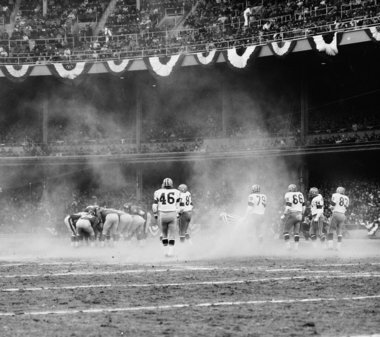 The date was December 30, 1962, the scene was Yankee Stadium, and the Green Bay Packers were battling the New York Giants for the NFL title for the second straight year. It was a cold, windy day in the Bronx, and reportedly there were no cell phones in use at the Stadium. While Green Bay was referred to as Title-town for its’ 1961 championship, New York was called Tittle-town, in reference to quarterback Y.A. Tittle. 1. Although the game was sold out, it was blacked out in New York per NFL television regulations of the day. Chris Schenkel and Ray Scott called the game on NBC. But you couldn’t see it in New York unless you had a ticket. (You can see it on this YouTube replay, with Ken Coleman and Ted Moore at the mike. Well at least some of it, there is missing video. And lots of cigarette advertisements.) And you couldn’t read about it either, since the city papers were on strike. So a slightly different New York State of mind. 2. How cold was it? It was cold. Freezing cold, Temperatures in the teens and winds gusting close to 40 mph. Players found inventive ways to warm themselves, huddling around small fires in metal trash cans on the Yankee Stadium sidelines. 4. It was a match-up of Hall of Fame quarterbacks, Bart Starr for the Packers and Y.A. Tittle for the Giants. In terrible passing conditions, Starr was 9-for-21 for 85 yards; Tittle completed just 18 of 41 passes for 197 yards. Neither threw a touchdown pass. 5. In fact, there were Hall of Famers all over the field that day, 16 starters to be exact. 10 Packer starters — Starr, Jim Taylor, Paul Hornung, Jim Ringo and Forrest Gregg on the offense, and Willie Davis, Ray Nitschke, Henry Jordan, Herb Adderley and Willie Wood on the defense — are all enshrined in Canton. And six Giants — Tittle, Frank Gifford and Rosey Brown on offense and Rosey Grier, Andy Robustelli and Sam Huff on defense– are in the Hall of Fame. 6. These were clearly the NFL’s two best teams in 1962. Green Bay won the Western Conference with a 13-1 record, the only loss coming to the Lions on Thanksgiving Day. The Pack ranked first in both offense and defense that year. New York was nearly as dominant, winning the Eastern Conference at 12-2. The Giants were seco nd in offense and fourth on defense in the 14-team league. 7. Guard Jerry Kramer, who authored Instant Replay, a diary of the Packers 1967 season, kicked three field goals for Green Bay to provide the margin of victory that day. Jim Taylor scored the only Packer touchdown; Rookie Jim Collier recovered a blocked punt in the end zone for New York’s lone score. 8. Green Bay linebacker and Hall of Famer Ray Nitschke was named the game’s MVP and drove away with a Corvette. Jerry Kramer was awarded the game ball. 9. If there had been a Super Bowl in 1962, the Packers would have faced the Dallas Texans, who won the AFL championship in 1962 a week earlier with a double overtime win over the Houston Oilers. Later in the decade, Green Bay would go on to win the first two Super Bowls. 10. After the game, Lombardi led his team in prayer in the Green Bay locker room. No champagne, no cameras, no music. Just the Lord’s Prayer. The winning share for the Packers was $6,000 per man. Yes, life was much simpler back then. Personally speaking — I was 11 years old, and I remember that cold Sunday afternoon in December of 1962. We went sleigh riding over the hills of a golf course in White Plains, NY, but not for long. It was too cold and windy. And I remember huddling with my father around the radio, listening to Giants’ announcer Marty Glickman call the game.